Dietary fiber is like the body’s cleaning lad; it not only helps rid the body of toxins, but also works to reduce cholesterol, decrease risk of heart disease, and so much more. The health benefits of fiber should not be overlooked. Essentially, fiber is the part of food that isn’t broken down by the body. Pretty vague, huh? Experts have had a difficult time defining fiber since its discovery. Most recently, there has been a movement to make that definition more specific by adding information about its benefits. So, what are the benefits of fiber? We all know dietary fiber to help make us ‘regular’, and prevent constipation. But there are a number of other benefits. As for insoluble fiber (the kind that doesn’t dissolve in water and instead creates a kind of gel), the benefits are that of a healthier digestive system. This is the fiber that “cleans you out”, so to speak, and keeps you regular. Soluble fiber, on the other hand, is known to reduce blood cholesterol and normalize blood sugar. Most plant sources of fiber contain both soluble and insoluble forms. Many experts say these classifications don’t do the fiber definition justice either—that they just don’t quite tell the whole story. Regardless of how you define and classify fibers, the health benefits of fiber are undeniable. By reducing your blood cholesterol levels, fiber is able to prevent heart disease. This is why you see many cereal brands, including oatmeal companies, touting their heart-healthy benefits. 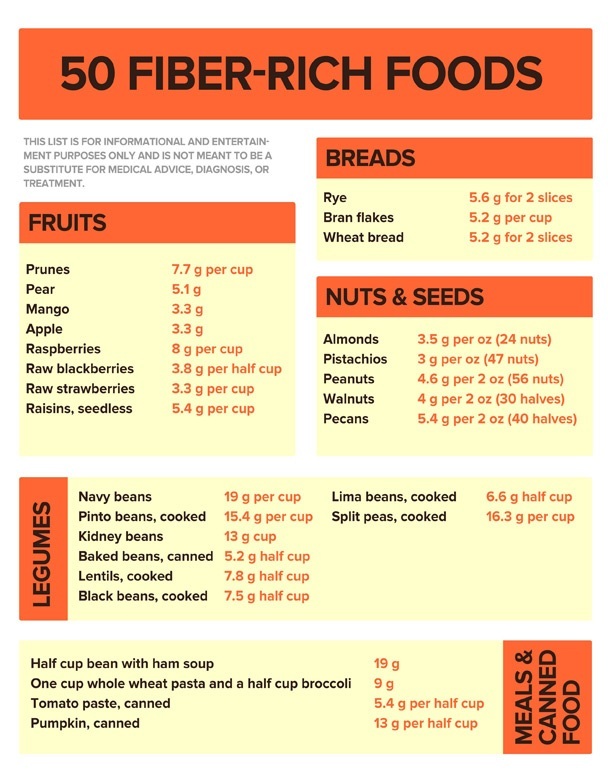 Fiber can also help regulate blood sugar levels and insulin response. In general, diabetics who eat a high fiber diet need less insulin than those who don’t. Further adding to the benefits, dietary fiber is also a beneficial tool in weight control. Both because it encourages elimination and helps you feel fuller longer, high fiber foods are useful in the battle of the bulge. Finally, fiber can increase digestive health. There are indications that this easier and more regular elimination can reduce the risks of colitis, colon cancer, and hemorrhoids. Ounce for ounce, beans and legumes are the best source of fiber. However, vegetables like dark green leafy veggies and cruciferous vegetables (broccoli, cabbage, etc.) are also excellent sources. 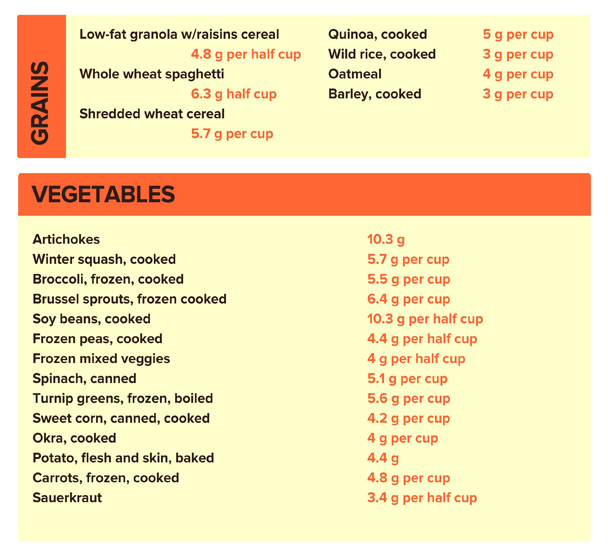 Be wary of those cereal-grain foods that promise “whole grains”—opting only for those with “100% whole grains” in order to get the most bang for your buck and bite. Improves Bowel Health – Dietary fiber helps to increase the weight of your stool while also softening it – ultimately paving way for an easier bowel movement and reducing any chance of constipation. Fiber may also help to solidify watery stools. And further adding to the health benefits of fiber, a diet rich in fiber could lower your risk of developing hemorrhoids and diverticular disease. Reduces Cholesterol, Blood Pressure – Soluble fiber found in beans, flaxseed, and oats may help lower “bad,” cholesterol levels. Studies have also found a connection between fiber and the reduction of blood pressure and inflammation. Promotes Weight Loss – Foods rich in fiber often require more effort to eat, helping you to realize when you’re full so you don’t over-indulge. Foods containing fiber also contain fewer calories than other foods in the same volume, and make you feel fuller faster. Helps Regulate Blood Sugar Levels – Fiber, especially soluble fiber, can help improve blood sugar levels – helping to reduce the risk of type 2 diabetes. NO, fiber isn't beneficial. It only causes problems. Find out yourself. Fiber Menace: The Truth About the Leading Role of Fiber in Diet Failure, Constipation, Hemorrhoids, Irritable Bowel Syndrome, Ulcerative Colitis, Crohn's Disease, and Colon Cancer. His website is here. Awesome info. Long overdue. Dr. Heath Motley – This is to sell a book! Remember, NOT everything you find and read on the internet is true you know. Be careful and use your common sense for heavens sake. you must be full of schitt! !